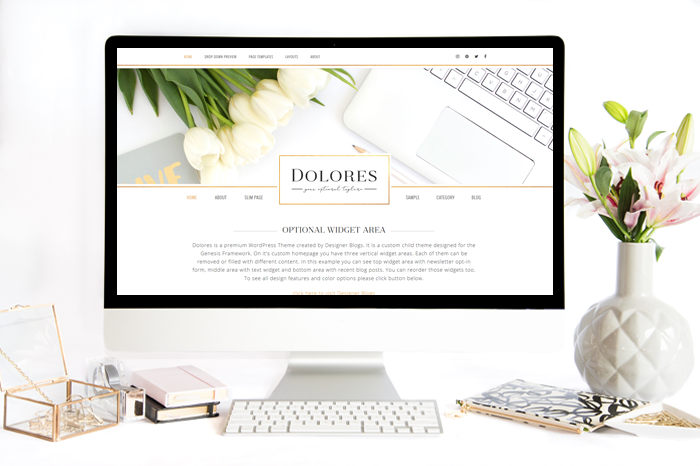 Dolores is a highly versatile WordPress theme, perfect for the blogger who needs clean and modern design. One of our skilled designers will take care of your theme installation, including any requested color changes and logo implementation all within one weeks time so you don’t have to worry about a thing. We offer an amazing post-install support package that will provide you with basic troubleshooting help as you settle into your new design. Includes mobile responsive coding, which means your design will fit every screen, from desktop to tablet to phone beautifully! Make sure to preview it here. Use three widget areas available at your landing page to showcase your recent posts or important information about your blog. Includes a styled three column footer which can be easily filled with widgets of your choice. Add up to four social media buttons of your choice to your top menu bar ($10 per additional button). Build your mailing list with conveniently placed opt-in box at your right sidebar and at your homepage (optional). The opt-in boxe works with FeedBurner, MailChimp, AWeber, FeedBlitz and more! Showcase your Instagram feed at the footer of every page of your website to encourage readers to follow you on Instagram. An unlicensed copy of the Genesis Framework will be installed with your design. If you would like to be a licensed Genesis owner so you have access to Genesis framework support, you can purchase your own copy of the Genesis Framework here. Choose between sidebar on the left, right or full width layout to present your content in perfect way. Having a primary and secondary menu is the best way to keep a well-organized site. You’ll specify to your designer the menu titles you’d like to feature on each menu bar. Feature your favorite photos with easy to edit background slider feature. This design includes modern categories pages build with two column post excerpts so your readers have easy access to your best stuff. Add even more menu buttons with build in drop-down menu style for both primary and secondary menu.